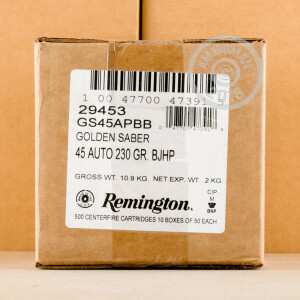 This 45 ACP round from Remington’s Golden Saber line of ammunition features a 230 grain projectile, the brass jacket of which hardens it substantially enough to let it pass reliably through tough barriers without deflecting. Once it has penetrated a target, the bullet’s jacket’s spiral nose cuts enable it to expand dramatically, as does the wide opening of its hollow point. 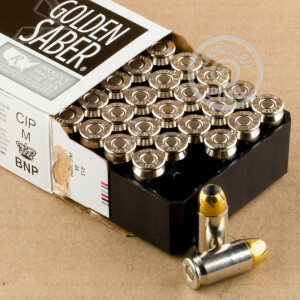 Its ability to expand even at lower velocities makes this bullet an extremely practical approach to self-defense. This round’s casing is made of brass and is reloadable, but it also sports a nickel plating which helps it to resist corrosion, as does its waterproofed mouth and primer. 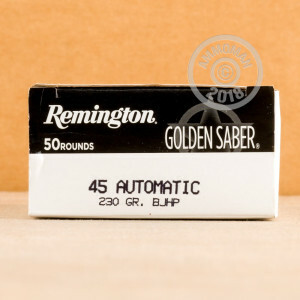 This cartridge is optimized for use in dark environments for a couple of reasons: First, its shiny casing makes a chamber check easier with little light to work with; Second, its low flash propellant means your first shot won’t blind you, letting you fire off fast follow-up shots or quickly acquire a second target.